Pierce Fire Apparatus manufactures six custom chassis for you to choose from. These include the Quantum®, Dash® CF, Velocity™, Impel™, Arrow XT™, and Saber®. Pierce custom chassis are known for their reliability, durability, ergonomics, and advanced technology. The main advantage of using a Pierce chassis is that it’s engineered, designed, and built to meet your exact needs, delivering the best firefighting apparatus for your application. Prior to delivery, each chassis undergoes rigorous testing by the largest full-time research and development team of any fire truck manufacturer in North America. More firefighters rely on a Pierce chassis than any other because when it comes to performance, a Pierce chassis will ride, handle, stop, and set up at the scene better than any other out there. 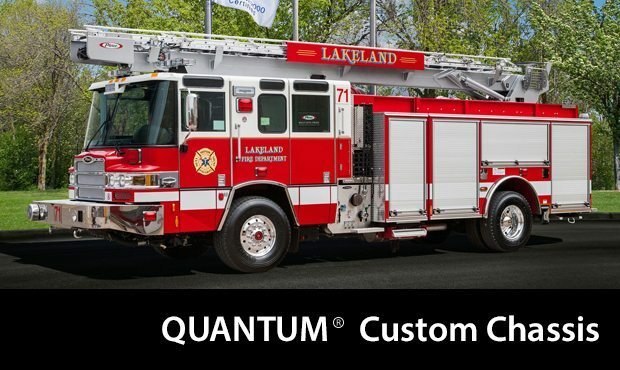 Since its introduction, the Pierce Quantum® chassis has set the standard for performance and technology in the fire industry. While the chassis stands out by appearance alone, it’s the features you’ll find inside the cab that really make a difference. A thoughtful use of interior space includes a flat floor, low engine tunnel, increased head clearance, and room for up to 10 firefighters. Key components of the Pierce PUC™ combine in this chassis to produce one of the most effective working environments out there. This chassis includes improved space for the driver and officer, lower step heights, additional storage options, a large windshield, and drop daylight windows for better visibility and scene assessment. This heavy-duty chassis also features a shorter wheelbase. 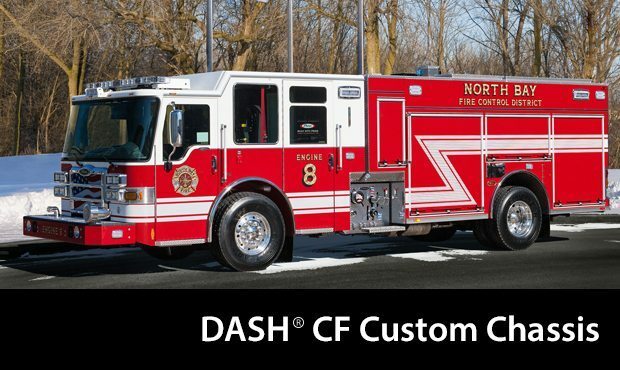 This custom chassis is a direct result of feedback from firefighters seeking the ideal fire truck. 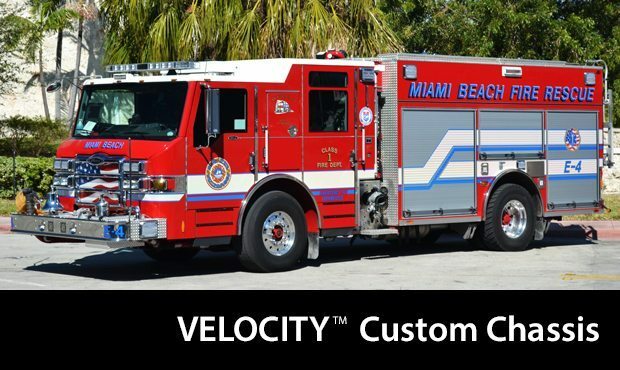 Focused on safety, space, storage, and maintenance performance enhancements, the Velocity™ advances the way fire trucks are designed. If you’re looking for improved visibility, more interior space, increased safety and seating, and easier maintenance, consider the Velocity™. 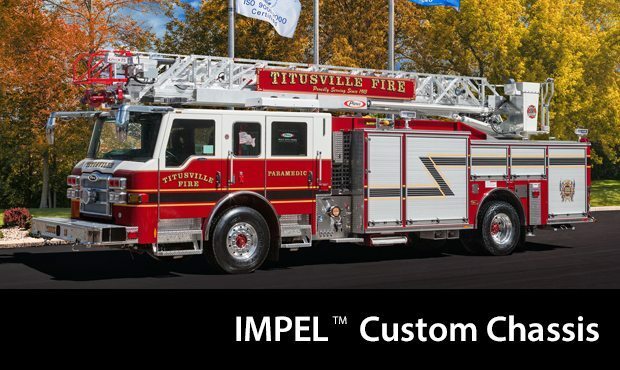 The Impel™ is a scaled down version of the Velocity™ to give you a full-featured truck at a budget-friendly price. This chassis offers improved cab space, enhanced visibility with a single-piece panoramic windshield, and the safety and comfort of PS6® seats. You can start with a base model design, and scale up with additional options and configurations. 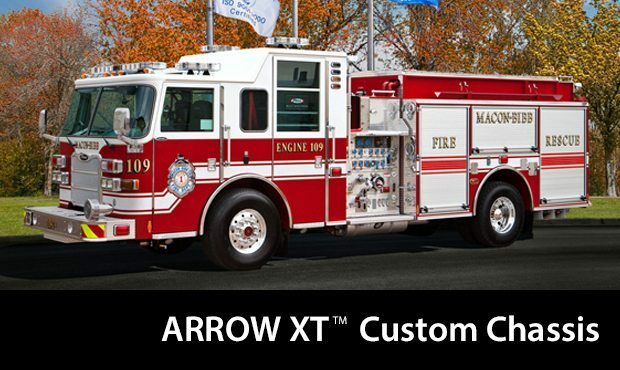 Delivering everything you need for firefighting, without the extra clutter and hassle of things you don’t, the Arrow XT™ is a premier fire truck chassis. This chassis offers you a choice of engines rated up to 500 hp. In addition, an “extreme tilt” cab allows for easy inspection of the drive train and brakes making it easier than ever to maintain and work on your unit. Other notable features include a standard TAK-4® independent front suspension and oversized 120 ksi 13-3/8” carbon steel frame rails with heat-treated liners. The metal interior includes an impressive heating and air conditioning system, and user-friendly instrument panel. You also have the choice of Pierce’s exclusive Command Zone™ or a hard-wired electrical system. 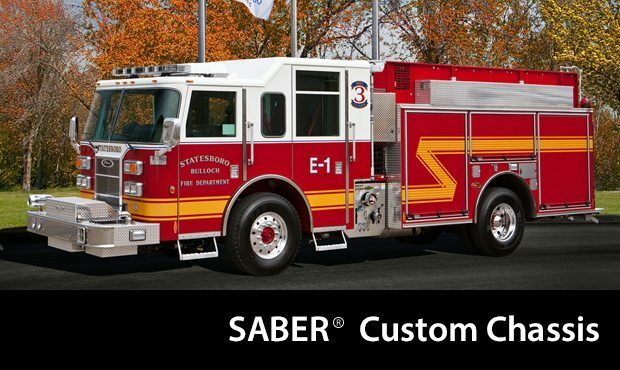 The Saber® chassis is the best choice for departments with a strict budget. The first of its kind introduced into the fire service, the Saber® can be configured as a pumper, rescue or Sky-Boom™ aerial – giving you the customization you need, at a price you can afford. This chassis gives you the choice of two engines, as well as countless other options such as two raised-roof heights and all-wheel drive. It also maintains interior storage space while offering superior maneuverability and a shorter wheelbase. Not sure what Pierce custom chassis suits your department’s needs best? Contact us today. A knowledgeable sales representative from the Ten-8 team will follow up to assess your requirements and point you in the right direction. The new Command Zone™ simplifies the way firefighters maintain their vehicles, prepare for calls, and monitor performance on the scene. It also features the industry’s first prognostic capabilities to keep departments on the cutting edge. This is the command center for your entire apparatus. 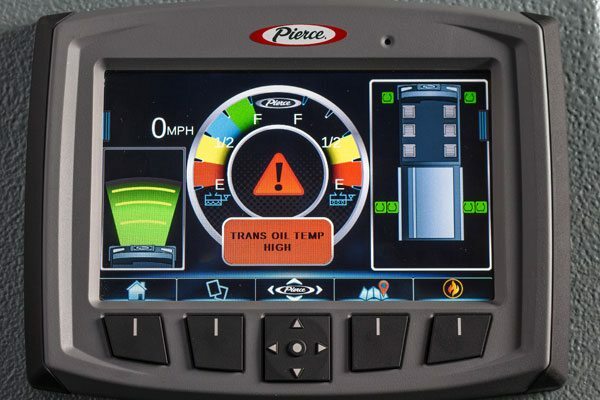 Electronic systems share vital information with the engine, transmission, pump, aerial device, seat belts, collision mitigation and more, so why not have all of that information at your fingertips (literally)? Frame Rail 13-3/8" 13-3/8" 13-3/8" 13-3/8" 13-3/8" 10-1/8"
Cab Width 96" 96" 100" 100" 94.75" 94.75"
Cab Length 67" or 74" 70" or 80" 60", 70" or 84" 60", 70" or 84" 57", 67" or 81" 57" or 69"
* This chart is for comparison purposes only. A Pierce fire apparatus sales representative from Ten-8 will be able to provide you more information regarding the wide range of specifications available on each chassis model.